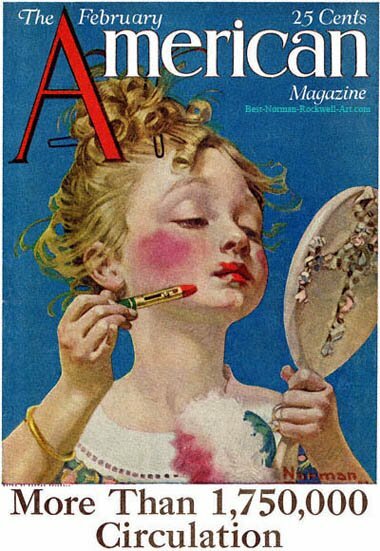 Little Girl with Lipstick, this Norman Rockwell painting, appeared on the cover of American published February 1922. This was the sixth Rockwell illustration to appear on the American Magazine cover. American Magazine only published seven Rockwell illustrated covers, all between 1918 and 1923. In this painting, Rockwell takes an amusing look at a little girl playing dress up. There are three main points of emphasis in this illustration: the mirror, the lipstick and the little girl, or more specifically her lips. All we can see of the hand-held mirror is its back handle. We are not privy to its reflective surface. We cannot see what the girl is seeing. We can safely assume that a beautiful lady is looking back at the little girl from the mirror's glass. We can tell that this not a new lipstick. See the adjustment button on the side; It is very close to the end. Why, her mother may have actually given her this lipstick to play with since it is almost spent. At least she will not get into too much trouble for her flight of fantasy. The most emphasis, rightly so, is given to the little girl. She has put her hair up on top of her head. She has rouge on her cheeks. We can see the pad she used for her cheeks sitting in front of her. And, of course, notice how her pinkie finger is extended. She is certainly training to be a lady. She is also wearing a dress that looks slightly too big for her. I base this observation on how the collar is situated on her shoulders. My favorite part of this composition is the girl's eyes. She is looking at the mirror with such a dreamy expression in her eyes; just like she has observed her mother doing. I cannot fathom how Rockwell so thoroughly wrapped his mind around this subject. Maybe his wife or even the girl helped him compose this idea. He was an expert at dressing his subjects up though. Rockwell had later revisited this subject of girls and makeup with Girl at Mirror. Do You Have A Great Story, Opinion Or Contribution About Little Girl with Lipstick?